Snack Girl is so proud of herself. She made this beautiful bowl of strawberry frozen yogurt (and then ate it). In my cute little town, we have not one, not two, but THREE places to buy frozen yogurt. Crazy. My children love these places because they allow you to serve yourself and you can put fun things like gummy bears on the yogurt. My daughter managed to ring up a $7 frozen yogurt when I wasn’t paying attention. Now, I always pay attention. But, who needs these pricey venues when you can make your own? 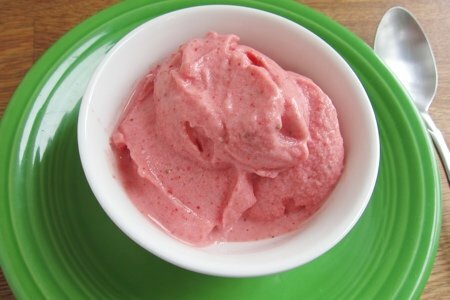 I made this lovely frozen strawberry frozen yogurt with my food processor and it took me about 5 minutes. I started with frozen strawberries, which is important for the “frozen” part of frozen yogurt. Then, I added yogurt and sugar. The sugar is optional. I tasted this and decided it needed a little bump to be truly a dessert. Feel free to substitute agave nectar, honey, or maple syrup for sugar here. You can use regular plain yogurt or greek yogurt. Whatever you have will work. Once you realize how easy this is, you will never buy frozen yogurt again. This is less expensive AND tastes so fresh! Put frozen strawberries in food processor and blend until minced. Add yogurt and sugar and puree. Serve immediately. Store it in a container in your freezer for future consumption. I always make my own yogurt! So much more healthier for you, than that store bought stuff! Plus you get lots more protein if you use greek!! How would you make chocolate yogurt? That is my FAVORITE! I love this recipe!! I am going to be trying it. I'd like to use greek yogurt with this. My family loves to go to the Fro Yo places in our town and before starting weight watchers my share would cost about $5. Now when I go, I fill the cup with fresh fruit (watch for fruit that looks like it has some sugar added though) and other low calorie tidbits, then I dot the top of it with the frozen yogurt, as if it were whipped cream. That way I feel much more in control of the portion size. And I know I am not overdoing it. Sometimes the yogurt comes flying out of the machine, but when you are simply dotting the top of your cup, it seems easier to handle. Looks delicious! Thanks for the great idea. I always make yogurt in my crock pot with no sugar. Or you can add what you prefer. You will never eat store bought again. I add fruit later when I eat it. If using Agave or Honey, would you still use the same amount or less? Yeah! We love this frozen yogurt and I make our own yogurt at home. Probiotic and Filmjolk yogurts combine with frozen blueberries to make a delicious frozen and healthy dessert. It is so good we don't even need gummie bears! I'll have to try this with organic strawberries and agave. Also wondering how much to use instead of sugar? That looks and sounds awesome! I'll definitely have to give it a try. How do you make frozen yogurt in a crockpot? You can also just regular freeze yogurt in original cartons if you don't want to take the time to make it...I did by accident once & was surprised how good it tasted - nice texture. Smart cookie! I am going to try this. I have been making my puppies their own frozen "frosty paws," for a couple of years now by using fat free plain yogurt with peanut butter...have you experimented with other berries as well? I'm going to try this with plain coconut yogurt w/o sweetener. Frozen mango would be good. You can find crockpot yogurt making instructions on the web. It is really easy. I have been doing it for a while and it is super easy. this sounds awesome! I will definitely try it...and I have strawberries and blackberries in the freezer to experiment with! Tried this but used Greek yogurt and less sugar..Delicious !!! Will be making it again and may try some different fruits.